Abbey Wood Industrial Estate users still making a mockery of Greenwich Council? I’ve been told that the industrial estate units in Abbey Wood at Lyndean Industrial Estate, where a murder occurred last week at yet another chaotic and illegal all night event beside residential areas, are still being used illegally for events. I stress that this is just something I have been told and not seen by myself, but if true then just how much further can the occupiers ignore the law and treat locals, and Greenwich council, with contempt? Without any sort of penalty that will cause a change in behaviour? Paper notices havn’t worked for a very long time. As I’ve said before, I wouldn’t really have a problem with it if visitors treated people living nearby with respect. But terrible parking and driving, noise and rubbish are foisted on people living nearby on a constant basis. The lack of action will see the problem spread to various corners of the borough, although I’m told it already is happening in quite a few places. There’s a planning application in now for a unit in Charlton at Anchor and Hope Lane. It lacks parking, and the document on transport states visitors will park along the road. It’s a road that is for access to quite a few business with HGV deliveries. It’ll hurt companies if the problem gets bad there. At Abbey Wood it’s not only Sunday mornings where events happen but many nights and days too. 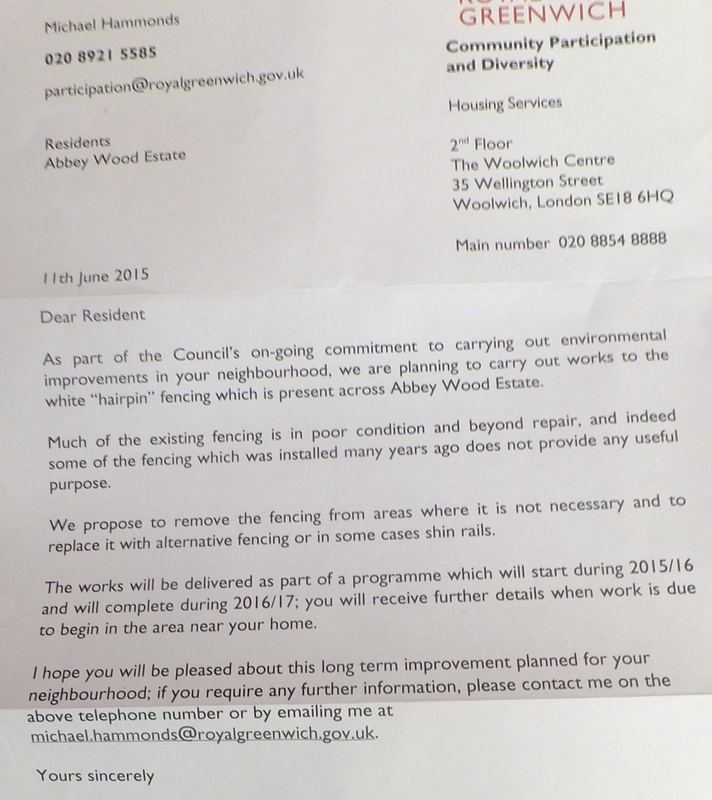 Still, on the bright side, Greenwich Council are to do some good in Abbey Wood. The old London County Council estate, built in the late 1950s, has been badly neglected for at least 15 years now. The council have announced they will be sorting out the streets and removing or replacing all the clapped out fencing around the place. There’s a ton of it, and being in such poor condition really brought the appearance of the wider area down. This sort of low cost, high impact work is to be applauded. I just hope they don’t install the very cheapest, ugliest replacement fencing they can source. If it’s unpainted, utilitarian steel rails as recently seen then that will do little for the appearance and perception of the town and estate, which badly needs a boost. Hopefully attractive timber fencing will be seen, as already installed in some places locally and elsewhere in the borough. Timber would be far more in keeping with the extensive greenery across the estate, which is one of its best features. The cost difference would be small; the impact substantial. Elsewhere in Abbey Wood, the tower at Cross Quarter and associated Sainsbury’s are now pretty much externally complete. I’m not overly keen on what I’ve seen in photographs. There’s a couple of weeks to go yet so hopefully some of the apparent alterations become clearer, such as the cycle lane and how it meets the station. I still think that large increases in supermarket traffic brought by Sainsbury’s and additional traffic lights, plus Crossrail and thousands of homes in the next few years, will add up to slow down journeys for people in Thamesmead to Abbey Wood station, possibly substantially. Crossrail is being sold to many as a solution to their problems. It isn’t anyway, as the existing station is already only 23 minutes from central London and that hasn’t helped, but adding 20 minutes onto a bus journey to the station will not help the town or it’s residents. Without widening and dedicated bus lanes on the main route, Harrow Manor Way, tailbacks are the likely future. Bexley is Bonkers covers this and has some photos here. What is really needed is a London Overground shuttle from Barking to Abbey Wood via Thamesmead, for the town to utilise Crossrail. Finally, the Cross Quarter site is due to see a new library open. There’s very few details on this, and the fate of the existing library is unclear. 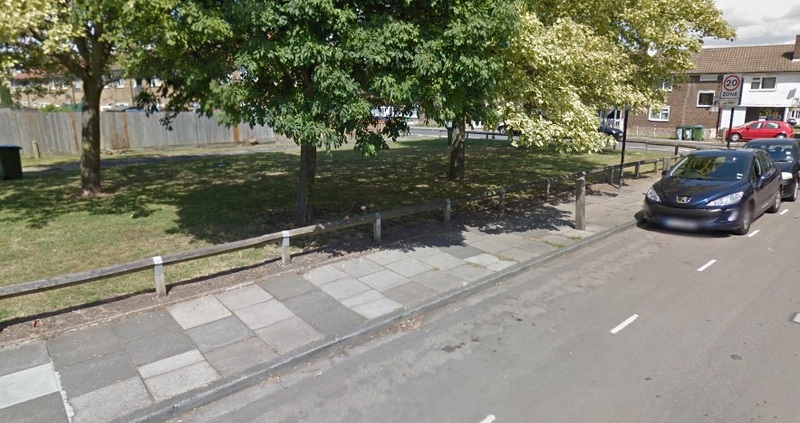 It is on Abbey Wood estate, and a move will see a long walk for some to reach any new site. Sometimes it appears the authorities forget just how far the station area is from certain areas of Abbey Wood and Plumstead, let alone Thamesmead. Whatever happens, the shop area could do with some work: It wouldn’t take much. Some trees in the expanse of paving would work wonders. Maybe it’ll happen soon; Greenwich council under Denise Hyland do seem to be caring more about the quality of public spaces and streets, and that’s worthy of praise.